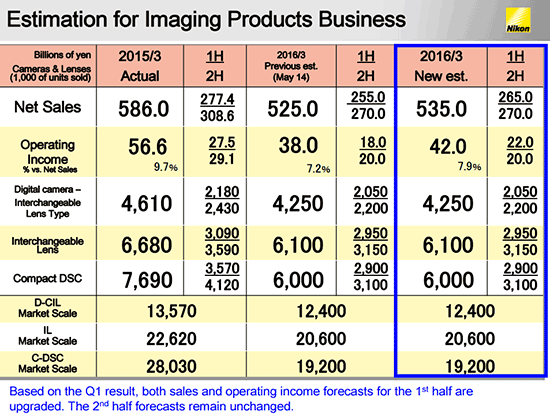 For the first half year, sales and operating income forecasts are favorably corrected by ¥10 billion and ¥4 billion, respectively, but the second half forecast is not changed due to uncertainty in the economic outlook. Yearly sales and operating income are expected to reduce by 9% and 26%, respectively, from the last year. (RTTNews.com) - Nikon Corp. (NINOF.PK, NINOY.PK), a Japanese manufacturer of image and video equipment, Thursday reported that its first-quarter net income attributable to owners of the parent declined 10.6 percent to 3.30 billion yen from last year's 3.70 billion yen. Earnings per share were 8.31 yen, lower than 9.31 yen a year ago. Operating income, however, climbed 12.1 percent to 3.93 billion yen from last year's 3.51 billion yen. Ordinary income also climbed 49 percent from last year. 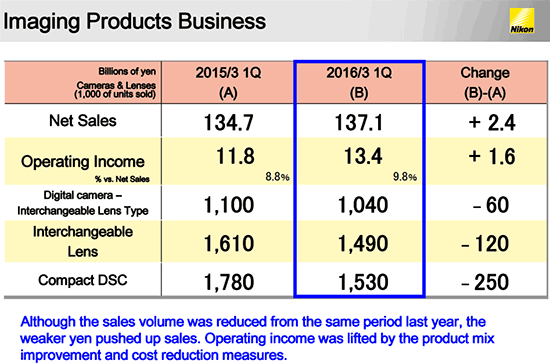 Net sales for the quarter grew 2.7 percent to 182.24 billion yen from 177.44 billion yen last year. For the first half, attributable net income is expected to be 5 billion yen or 12.60 yen per share, sharply lower than last year, while sales are projected to grow 2.4 percent to 384 billion yen. Looking ahead, for the year ending March 31, 2016, attributable net income is expected to be 20 billion yen or 50.42 yen per share, a growth of 8.9 percent from last year, on net sales of 870 billion yen, 1.4 percent higher than last year. Previously, the company projected net sales of 860 billion yen.